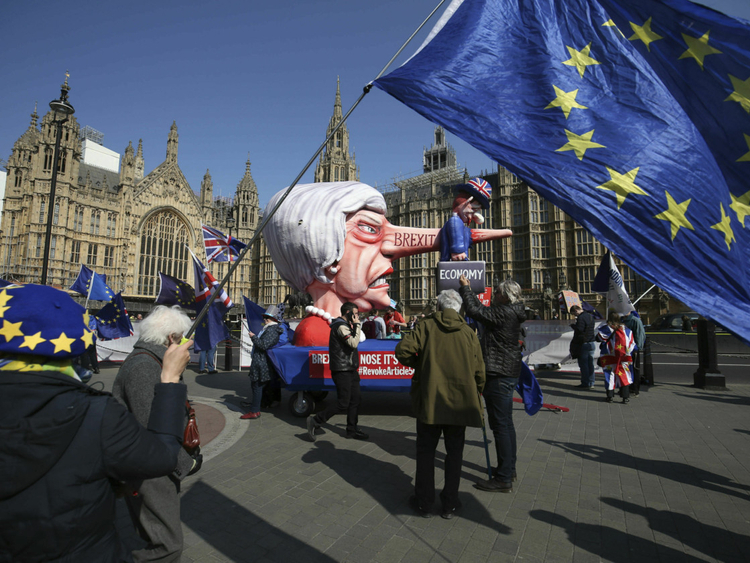 If you have been following the intricacies of this Brexit mess for the past two years — and there is no blame to be assigned if you didn’t as that likely speaks to your wisdom in ignoring this abysmal soap opera — then the developments on Tuesday afternoon in Westminster might indeed prove to be pivotal in at last finding a way forward. After a seven-hour cabinet meeting at 10 Downing Street — a meeting that saw the 30 ministers or so present have to hand over their cell phones so as to be incommunicado with the various disparate and desperate elements of the parties within the ruling Conservative party — Prime Minister Theresa May emerged to say that she would be reaching across the floor of the House of Commons to talk to Labour leader Jeremy Corbyn to try and reach common ground on finding a way forward. It was a very significant moment in many, many ways. Firstly, it shows that the united front of the European Union and the European Commission — the cabinet-like body that’s responsible for the day-to-day running of the EU — won out. At the very start of these negotiations, there was an arrogance of the British who believed that Brussels would bend to their way of thinking. These modern-day pinstriped double-breasted empire loyalists projected the notion that they were somehow superior, that Britishness would win, and that the divided continentals would cave. Well, that’s pure poppycock. The EU27 stood firm, stood united, and simply outplayed the Brits at every turn. Secondly, it shows that the withdrawal agreement negotiated between the EU and London is the only deal that was ever on the table. And it still is. The talks now between May and Corbyn — and whatever comes of it — will only be amendments to the so-called political protocol, the secondary document that can say black is white but has little meaningful effect. Thirdly, it’s a vindication of the need for that Irish backstop, the guarantee that no matter what happens, the border between Northern Ireland and the Republic of Ireland will remain open. That was a concession agreed to some 16 months ago by May, and if she thought at the time that it could be ignored or watered down in later talks, she was plainly wrong. Fourthly, the EU said all along that the only way forward if the Brits wanted the economic benefits of the bloc, the only way forward is to accept belonging to a customs union. Right now, that is indeed what May and Corbyn will likely agree. In accepting this, May has definitively put a wedge between the hardline Brexiteers on her party’s right, and they will be consigned to whine and dine with Old Etonians, cite Cicero and remain as patricians of a party that has proven itself out of touch, out of sync with reality, and out of room to manoeuvre. Fifthly, that matter of €50 billion (Dh206 billion) that the Brits must pay as their dues to the EU for existing and future budgetary commitments will now have to be paid. So much then for those entitled twits who uttered Brussels could go and whistle for as much as a single penny when the Brits left. Sixthly, there was a belief that Brussels would cave and would give way in the hours as the Brexit clock wound down. Nope. Not an inch. No surrender. It’s the Brits didn’t know what they wanted, couldn’t decide on a way forward, and have wasted every ounce of goodwill they might have amassed by sowing confusion. Should the amount of hot air arising from the Commons these past months be considered part of the UK’s carbon emissions, then global warming truly is irreversible. The reality now is that that withdrawal agreement, voted down three times already by MPs, remains the only way forward. And, by reaching across the Labour, May has now ensured that that bill will pass at its fourth time of asking — if the Speaker of the House of Commons allows it to happen. Yes, he will. Above all, John Bercow is a practical man, one who is about to step aside next autumn in the new session of parliament. He will have secured his place in the footnotes of history and will likely make a small fortune on the international dinner speech circuit when this is all done and dusted. May too is a prime minister whose legacy up to this has been confusion, indecision and an ability to divide as never before. In a single stroke necessitated by her simply being so stubborn, her party so divided, her cabinet so mutinous and the Commons so rudderless, she had only one play left — to reach out to Labour. While nothing is yet certain and the Conservatives have shown themselves capable of any amount of madness, there is now a way forward. But why, why, why, did we have to get to this?